I was asked to make some Peanut Butter Bars and Lemon Bars for a family who was celebrating their daughter's mission call to serve in California. Knowing my recipe for Lunch Lady Peanut Butter bars already filled a 13"x18" half sheet pan, I wondered if a 9x13 lemon bar recipe could be doubled and fit into a half sheet pan. You know, 9 doubled is 18, right? I am a daughter of a state-wide renown mathematics educator. My dad taught high school math/algebra/calculus for many years. He was on the State Mathematics Board. All through junior high and high school, every one of my math teachers, when they saw my name on their class list, said, "Are you Mr. Shell's daughter? The math teacher?" Mumbling, my response was barely audible, "Ummmmm....yeah..."
"He taught me math! You must be very good at math!" I am terrible at math. I use my fingers to count. It took me years before I figured that decimals, fractions and percents were actually the same thing. Calculators are my best friend. Tears have been shed over imaginary numbers and complex fractions. I squeaked by with barely a C in the lowest level math course offered in college. Nowadays, Google is my friend! I posed this very question to Google about doubling a 9x13 recipe and stumbled on King Arthur Flour's article, "When More Is Better,"
If you love math, read the rest of this article and revel in volume, square inches, percentages and all that fun stuff. This recipe has the perfect ratio of crust to filling. The addition of cornstarch in the crust helps make it melt-in-your-mouth delicious. Did you know there is a recipe calculator available? My Kitchen Calculator to the rescue! *I highly recommend trying MEYER LEMONS, if they are available. They have a perfect citrusy blend of lemon and orange. They are seasonal, so if you can find them, I suggest zesting, juicing these lemons and freezing them for future lemon bars and other lemony recipes. 1. Prepare your 13"x18" pan by lightly greasing it and lining it with parchment paper or aluminum foil. Lightly grease the foil/parchment paper. This will help get your lemon bars out of the pan easier. 2. Mix the flour, powdered sugar, and cornstarch in a large bowl or food processor. 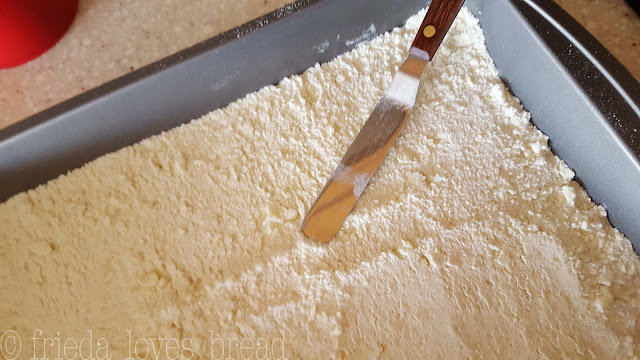 Add the room temperature butter squares and blend with a pastry blender, a fork or food processor, until it looks fine and crumbly. 3. Sprinkle the mixture into the prepared pan and level it with a rubber or offset spatula to create an even layer. *Yes, I know this isn't a 13x18 pan ~ I couldn't find the picture! 4. Press the mixture with a rubber spatula or sturdy glass firmly on the bottom and about 1/2" up the sides. Bake the crust in a preheated 350°F oven for 20 minutes. 5. Prepare the filling by whisking the eggs, sugar, salt and flour. 6. Add the lemon zest, juice and milk. Beat for 3 minutes until mixture is slightly thickened. 7. Pour the filling into the WARM crust and turn down the oven to 325°F. Bake for 18-20 minutes or till the filling feels slightly firm to the touch. Cool the bars on a wire rack for 30 minutes. Sprinkle with additional powdered sugar, cut with a sharp knife or pizza cutter and serve immediately. 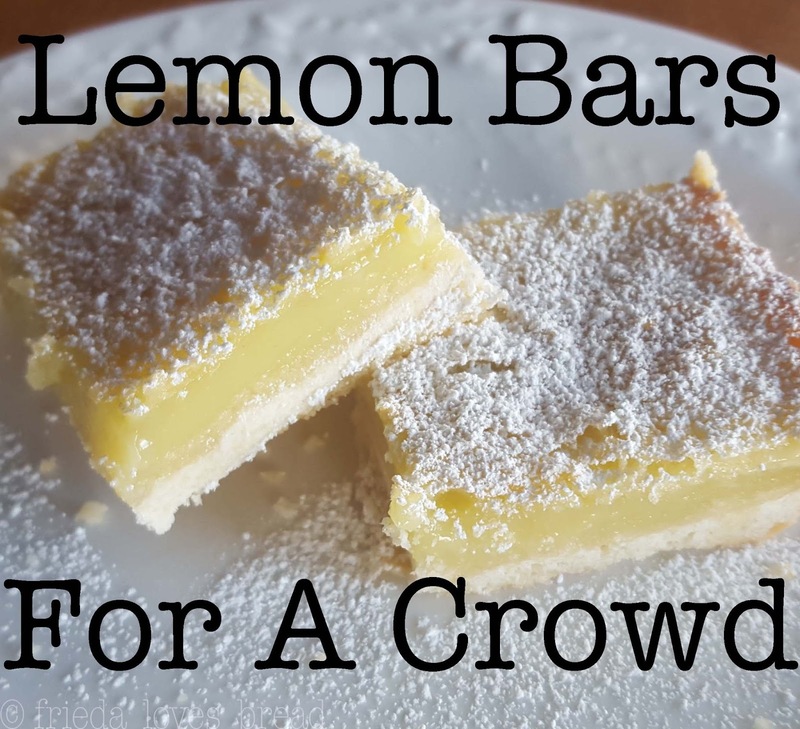 Lemon Bars for a Crowd 18"x13"
A large half-sheet baking pan (18"x13") is perfect for making a large batch of these perfect, sweet, & tangy lemon bars. The cornstarch in the crust helps create a melt-in-your mouth texture. I highly recommend using Meyer Lemons, which are a citrusy blend of a lemon & an orange. They are seasonal, so if you find them, juice and freeze them for these amazing cookie bars. Sprinkle a dusting of powdered sugar on cooled bars, just before serving. 1. Preheat oven to 350°F. Lightly grease a 13"x18" baking sheet pan and line it with parchment paper or aluminum foil. Lightly grease the top of the paper/foil.2. 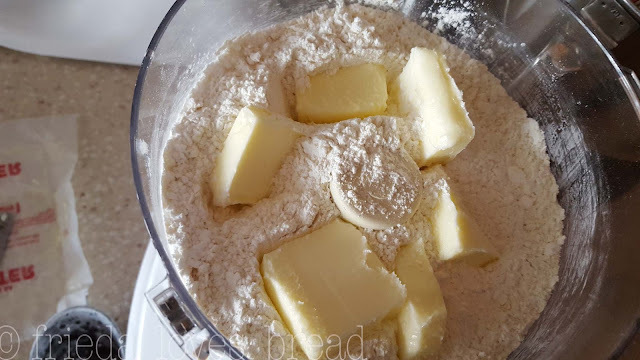 Mix together flour, powdered sugar, cornstarch (and salt, if using UNsalted butter) in a large bowl or food processor.3. Add the room temperature butter and using a pastry blender, 2 forks or food processor, mix till mixture is fine and crumbly.4. Sprinkle the mixture into the prepared baking sheet. 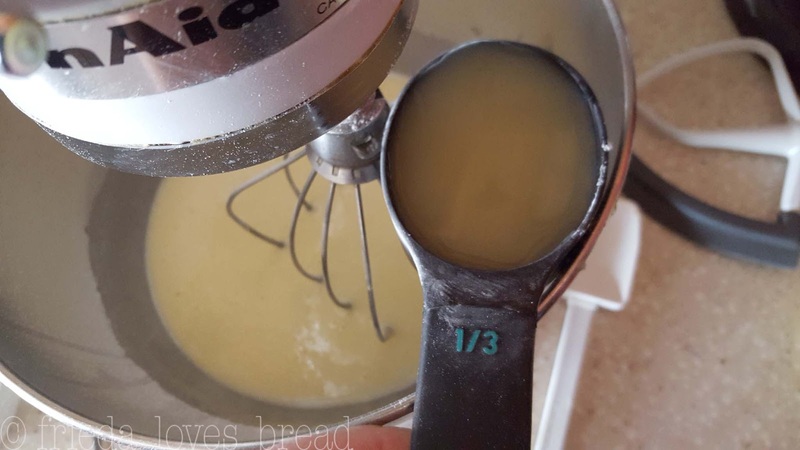 Use a rubber or offset spatula to make an even layer and press firmly with the spatula or a sturdy drinking glass on the bottom and 1/2" up the sides of the pan.5. Refrigerate the crust for 30 minutes. Bake the crust for 20 minutes.6. Prepare the filling. Whisk the eggs, sugar, salt and flour in a medium bowl or electric mixer with whisk attachment. Add lemon zest, juice and milk. Beat for 3 minutes, until slightly thickened.7. Pour the filling into the WARM crust and REDUCE the oven temperature to 325°F.8. Bake for 18-20 minutes, or till the filling feels slightly firm to the touch.9. Cool the bars completely on a wire cooling rack, about 30 minutes. When bars have cooled, sprinkle tops of bars with powdered sugar and cut into bars. Serve immediately.Refrigerate any leftovers for up to 2 days. 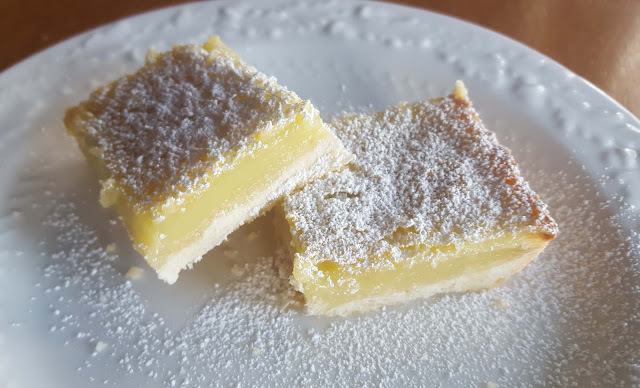 Perfect, sweet, & tangy lemon bars, with just the right ratio of crust:filling. The cornstarch in the crust helps create a melt-in-your mouth texture. I highly recommend using Meyer Lemons, which are a citrusy blend of a lemon & an orange. They are seasonal, so if you find them, juice and freeze them for these amazing cookie bars. Sprinkle a dusting of powdered sugar on cooled bars, just before serving. 1. Preheat oven to 350°F. Lightly grease a 9"x13" baking sheet pan and line it with parchment paper or aluminum foil. Lightly grease the top of the paper/foil.2. Mix together flour, powdered sugar, cornstarch (and salt, if using UNsalted butter) in a large bowl or food processor.3. Add the room temperature butter and using a pastry blender, 2 forks or food processor, mix till mixture is fine and crumbly.4. Sprinkle the mixture into the prepared baking sheet. Use a rubber or offset spatula to make an even layer and press firmly with the spatula or a sturdy drinking glass on the bottom and 1/2" up the sides of the pan.5. Refrigerate the crust for 30 minutes. Bake the crust for 20 minutes.6. Prepare the filling. 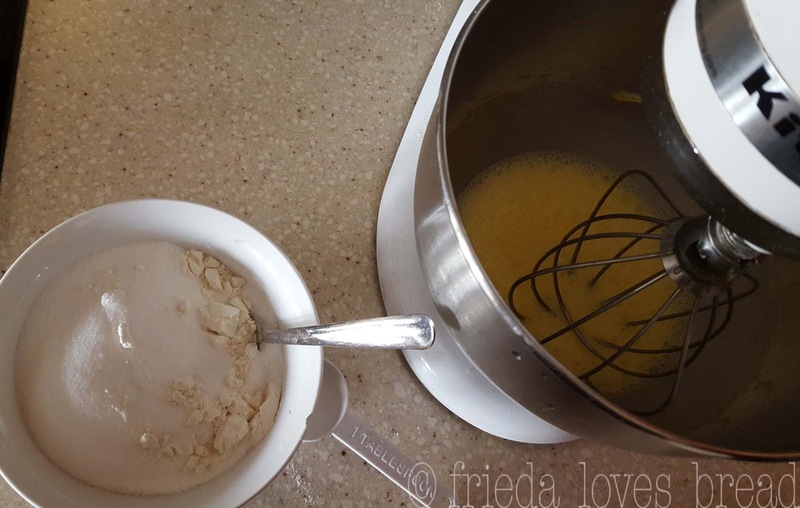 Whisk the eggs, sugar, salt and flour in a medium bowl or electric mixer with whisk attachment. Add lemon zest, juice and milk. Beat for 3 minutes, until slightly thickened.7. Pour the filling into the WARM crust and REDUCE the oven temperature to 325°F.8. Bake for 18-20 minutes, or till the filling feels slightly firm to the touch.9. Cool the bars completely on a wire cooling rack, about 30 minutes. 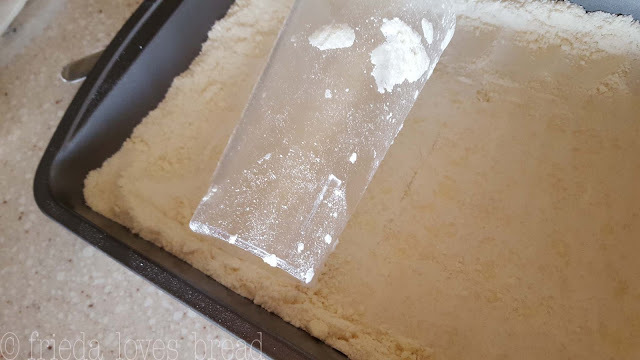 When bars have cooled, sprinkle tops of bars with powdered sugar and cut into bars. Serve immediately.Refrigerate any leftovers for up to 2 days.